This smart safe and app combo keep valuables like cash, passports, and medicine secure. 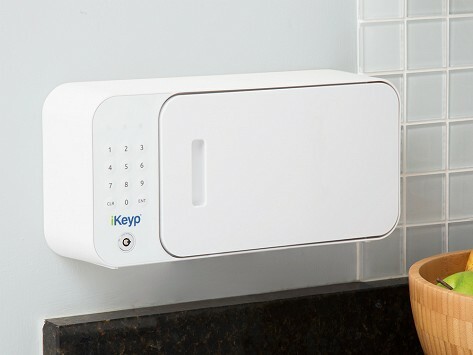 iKeyp can be opened with the water-resistant keypad, with the back-up key, or remotely through its app. Rest assured knowing you’ll get real-time visual and audible alerts for things like failed keypad attempts or unexpected movement. The Pro has retractable wings for easier portability, while the Bolt is a more permanent security measure. Bolt Exterior Dimensions: 6" x 12.8" x 3.4"
Weight: Bolt: 2.98 lbs. ; Pro: 4.15 lbs. Fits in a drawer nicely. Have not been able to use the feature of being notified if someone is trying to open it. I like the device a lot so far. My only real complaint is that the mobile app requires me to "get an account" before I can use it. In use it. Makers Jeffrey Padilla and Mitch Danzig had medicine on their minds when they created the iKeyp smart safe. They wanted to keep pharmaceuticals out of the hands of young children and anyone else who shouldn’t have them. With its humidity-sealed storage compartment and ability to send medication reminders, iKeyp is a perfect way to keep pills safe and accessible. But Jeffrey and Mitch quickly realized that iKeyp is also a great way to keep cash, passports, and other valuables locked down. iKeyp is compact enough to store in deeper medicine cabinets, drawers, or bookcases. We think it's a particularly smart solution for shared spaces, like apartments or dorms. The safe can be opened by entering a pin on the keypad, with a back-up key, or remotely through the app. The app can send visual and audible alerts for things like failed keypad attempts or if the safe is moved, enabling you to double-down on security from anywhere.